WordPress includes five different roles to manage the users that are registered on your site. However, you also have the ability to customize these roles and even create new ones. In some cases, the additional users you add to your site will fit nicely into one of the default roles, with the tasks they are carrying out on your site matching the capabilities of that role. However, this isn’t always the case and even something as simple as adding a new user to write posts for your blog can give you cause for concern, in terms of the access they will have to your site and its content. In this post we will be taking a look at plugin that gives you more control over the default WordPress user roles, allowing you to modify them and create new ones with custom capabilities to exactly meet your needs. There are many reasons why, and situations when you might want to create custom roles for your site. One common occurrence is related to adding guest or staff writers to your blog. If you’d like to add a user to your blog to write content, then you might instinctively choose the Author or Contributor role. However, by default the Author role has the ability to publish posts on your site, which is a power you might not want to give a new member of your team straightaway. Users with this role can also edit and delete published posts that are already live on your site and have been created by other users. With that in mind, you might think that the Contributor role is a better option, due to their more restricted access. However, those with the Contributor role, while not being able to publish content, or edit existing content, cannot upload files, including image files for use in their posts. By using the default WordPress roles, this puts you in somewhat of a quandary as to which role to assign the writers who produce content for your blog. Do you either give them enough access to do their job, while also being able to make far reaching changes to your published content; or play it safe with the result of not giving them enough access to complete their tasks? This is where being able to customize and create new user roles on your WordPress site becomes a useful ability to have. While there are a few different options for editing the existing roles, and creating new ones with WordPress, WPFront User Role Editor is a great option as it not only has all the features you will need, but also has a clear and easy to use interface. This free plugin is also regularly updated, has been downloaded over 45,000 times, and has a near perfect user rating of 4.9 stars of out 5. From the Add Plugins screen, enter âWPFront User Role Editor’ in the search field and then install the first item listed in the results. Once the plugin has been installed and activated, the tools can be accessed from the newly created Roles menu on your site’s admin dashboard. From the All Roles screen you can view all the existing roles on your site. 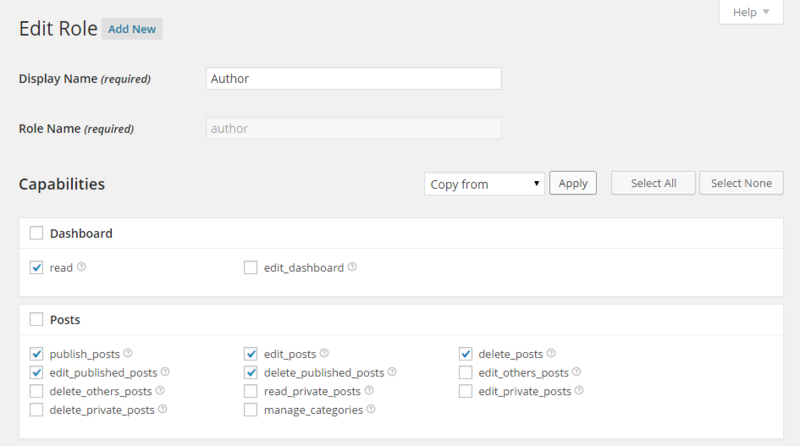 This includes the 5 default WordPress roles, as well as the 12 custom roles this plugin creates. If you click on a role, you can then see which capabilities users with that role currently have on your site, in a nicely organized, easy to read format. While there are many occasions when you might want to customize a WordPress user role, to address the scenario mentioned earlier, one option would be to modify the existing Contributor role so that those users can add images to their posts. To do this, simply click on the Contributor role from the list of roles page. Then find the capability you would like to enable or disable for this user role, and check or uncheck the relevant box. If you are unsure of what each capability relates to, clicking on the help icon will open a description in a new browser tab. Once you have finished editing the capabilities, you can click the Update Role button to save your changes. Now users with the Author role will be able to add images to their posts, without having the ability to publish their content. This allows you to approve their posts before they go live on your site. If you lose track of your changes, or need to reset them for some reason, the Restore link on the Roles menu allows you to restore the individual roles on your website to their default states. Customizing the WordPress user roles, or even creating your own custom roles might seem like an advanced task. But if you are adding additional users to your site, whether to write content, keep plugins up to date, carry out design tasks, or anything else, having more control over exactly what they can and can’t do on your site is a good security precaution to take. If you have any questions about this plugin or managing the users on your WordPress website, please leave a comment below.